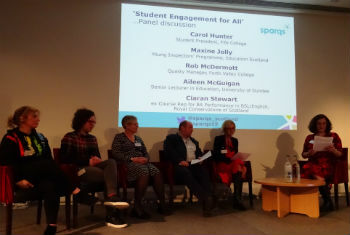 A huge thank you to everyone who attended and contributed to the sparqs' Conference on Thursday 28th March 2019, at Surgeons' Hall in Edinburgh! The day was a great success, with a fantastic turnout of around 200 delegates from Scotland and all over the world! You can read the conference Twitter story for an overview of the day! We were delighted that the conference was opened by Karen Watt, Chief Executive of the Scottish Funding Council. The day was a blend of keynote sessions, panel discussion and a range of workshops, presentations and poster displays. Huge thanks to all our speakers, panel members and session presenters - we heard lots of good feedback throughout the day about the range of interesting and inspiring presentations! Thank you also to the fantastic team of BSL/English Interpreters who signed the conference throughout the day. In a fitting end to the day, the conference was rounded off with the third sparqs' Student Engagement Awards! We invited students' associations and institutions within Scotland to submit nominations across a range of six categories. Delegates attending from outwith the UK were also offered the opportunity to attend an additional International Delegates' Day on Wednesday 27th March, the day before the main conference. The day provided an opportunity to learn about the Scottish context of student engagement, including a visit to the University of Dundee, with some sightseeing and Scottish hospitality along the way! We received great feedback about the day from the 20+ guests who joined us on the trip to Dundee. Many thanks to Dundee University Students' Association and University of Dundee for hosting our guests, and to QAA Scotland for their input to the day.